The Gay Gamer: The PS2 ain't dead yet! How am I supposed to even think about buying a PS3 when there are so many PS2 games I haven't bought yet? 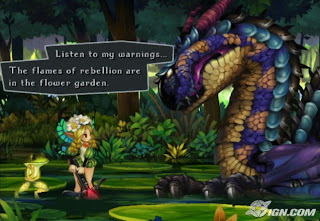 Along with Chulip, Dawn of Mana and Grim Grimoire (which admittedly isn't out in Japan yet, let alone in the U.S.), my "desperately need to buy" list includes Odin Sphere, a 2D side-scrolling love fest crafted by the same people who made the wonderful Princess Crown on the Sega Saturn all those years ago. Odin Sphere looks similar to Princess Crown, although it looks like you get to choose from five different characters from the start. After that, though, it looks like more of the same side-scrolling hack-and-slash action, with a bit of RPG thrown in for good measure. Check out a trailer featuring all that and more at Atlus' official site. Click on "Archives" and look for the link to the trailer.